Last year 366 million litres of paint (retail and trade) were sold in the UK. Of this, it is estimated that approximately 55 million litres are unused, stored in homes or garages or just thrown away. Paints should never be poured down the drain as they can severely pollute watercourses. Try using organic and VOC free paints as alternatives to standard hazardous paints. BBC and Dulux are just two organisations that provide online calculators. You can use these to help you work out how much you might need of different types of paint before you buy. Residents can dispose of unused paint of up to 5 litres at the Centre. 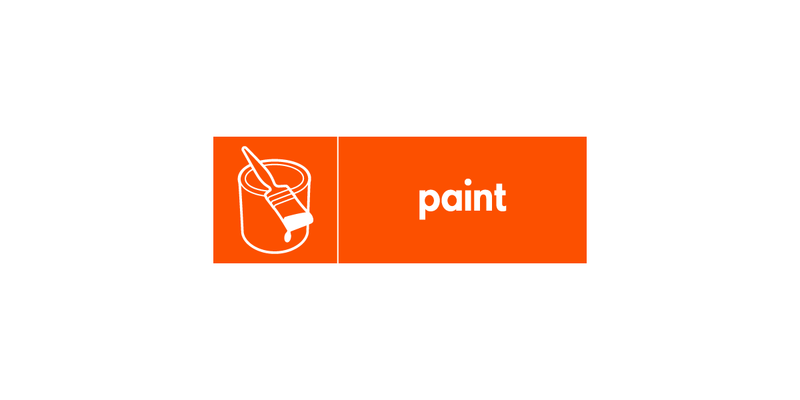 It is preferable if the paint is dry and hardened and so, to assist with the drying out process, residents should leave the lid off the paint container before bringing it to the Centre. Adding cat litter or sawdust will help the drying out process further. Water-based paint, once dried, residents can deliver it to the Smugglers Way Household Waste and Recycling Centre and place it in a Rubbish Only container. Oil-based paints should be delivered to the Centre and placed in the Paint storage container in Recycling Bay A. If the paint cans are empty, please place them in a Scrap Metal container for recycling.